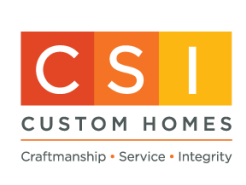 At CSI Custom Homes we take pride in all that we do, but we are most rewarded by the life-long customer relationships we build in the process. It’s often said that the best compliment is a referral of friends and family, and in that way we are truly blessed. "I have never found a builder with a better set of qualifications than Todd Blocker. What I valued most of all is his ability to trouble shoot any issues, offer creative solutions and really adhere to the homeowner’s project vision. Working with CSI Custom Homes means you are working with a trustworthy group of professionals. The CSI group has honesty and integrity that rises to the top, under any circumstances." "I had a great experience working with Todd Blocker and the entire team at CSI Custom Homes. Todd is a problem solver. He keeps his clients apprised of what’s happening on the job and is always accessible. When issues arise during a project Todd’s approach is to tackle things promptly and professionally, and always with an eye for what will benefit the home owner. Without reservation I would recommend Todd Blocker and CSI Custom Homes for home construction and renovation." "I can’t say enough great things about Todd Blocker and his reliable team at CSI. If you want a great experience working with an honest and smart custom home builder – look no further. It’s like a breath of fresh air to work with a﻿ builder who provides realistic budgets, top-quality subs and is a joy to work with on a daily basis. Over the years the quality of their craftsmanship withstands the test of time. If I were to remodel or build another home, without hesitation I'd use CSI Custom Homes." "CSI Custom Homes has completed several projects design by CJW Architecture over the years. Todd and the company are a great local choice for projects of every size and level of complexity. They are fun to work with and professional in their execution. We regularly introduce Todd and his company to our clients. We look forward to the construction of the projects CSI Custom Homes is selected to build. They bring attention to the details and quality that is "right" for our clients' project." "CSI Custom Homes deliver a great overall experience that comes from their constant attention to detail and genuine desire to please their customers. They have the experience, expertise and industry connections to handle every aspect of any project, big or small. But what impressed me most in working with them was their awareness and concern as to the impact of their presence in our home and community. CSI kept our job site clean and their noise levels low. They completed their work on time and on budget, I'd hire them again in a heart beat."